Twyla Tharp is a dance pioneer whose work, by its incredible diverse richness, eludes simple categorization. She emerged in the 60s as a singular voice, parallel to and sometimes convergent with the Judson movement, at least in the rejection of classical forms of ballet and modern. Her work has dipped into jazz, ballroom, and even sports, but she has fully embraced ballet as well, creating monumental pieces such as In the Upper Room. Broadway beckoned, and she created a smash hit with the Billy Joel jukebox musical, Movin' Out, and the Sinatra-themed Come Fly Away. For the last decade, she has also choreographed concert dances for companies such as ABT, which has also performed earlier repertory work by her. She has also dedicated herself to her own company, which she gathers periodically for performances such as the one at the Joyce last week (and where she has a creative residency). 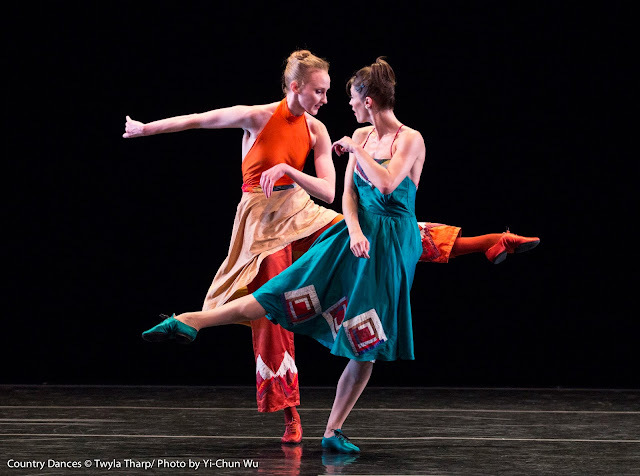 The run's title is self-explanatory—Twyla Tharp and Three Dances, culled from different decades. Country Dances (1976) was done in her slinky, slippery, jazzy style that often reminds me of a pile of puppies playing. Tharp uber-veteran John Selya, and Amy Ruggiero, Eva Trapp, and Kaitlyn Gililland dance to a song list of country and folk. Santo Loquasto provided the costumes, which were modern twists on Western garb. (Though Selya's royal blue placket shirt more closely resembled Coach Taylor's windbreaker on Friday Night Lights than a cool pearl-snap shirt, but Gililland wore a neat backless orange halter with an overskirt and Eva Trapp's green dress with quilt accents was striking.) All manner of a quartet and its divisors comprise the dance, which is also dotted with moments of forced joviality that don't always hit the mark. Gililland demonstrates a haunting intensity in her stage presence that compounds her impressive physical bearing as a very tall ballerina (she is a guest and former company member of NY City Ballet). The NY premiere on the slate is Beethoven Opus 130, featuring Royal Ballet guest Matthew Dibble. The prevailing style is more balletic, but happily, the women wear soft shoes. This immediately gives Tharp more freedom to push the shapes, attack, and speed of the womens' movement, and doesn't force everything to be about pointe work and form. (I love the lines myself, but it is no small tyranny in ballet choreography these days.) Norma Kamali, another longtime Tharp collaborator, designed the mens' batwing tops and somewhat unflattering high-waisted tights, the womens' rompers and, for Gililland, a gorgeous, sheer, structured dress. Valiant ballet moves popped up with regularity, displaying the technical chops of the eight top-notch cast members, and velocity played an important role as dancers flew and hurtled across the stage. Dibble has a seamless plushness to his movement that suits Tharp's style perfectly, along the lines of Baryshnikov, one of her muses. But the heroic performance of the evening no doubt belonged to Reed Tankersley, who led off the third work, Brahms Paganini (1980), with an extended and exhausting solo. The feel of the choreography here is also predominantly ballet-based, mixed with a grab bag of other styles by tinkerer Tharp. She regularly uses endurance and fatigue as active elements, both on the part of the performer—Tankersley's crisp linen outfit by Ralph Lauren is damp and wrinkled by the end of his solo—and audience, stunned at his fortitude and by the requisite unerring observation. He's joined by four dancers (and a cameo by Gililland), who perform complicated, athletic lifts and duo passages at a frenetic pace. It is a joy to see Tharp, one of our time's true and diverse choreographic talents, continue to create and have the chance to present her concert work in such a suitable setting as the Joyce. I liked your explanation about using endurance and fatigue as active elements - I have felt the effect but never knew how to describe it so succinctly!